"According to my database, Blackberries have cooties." 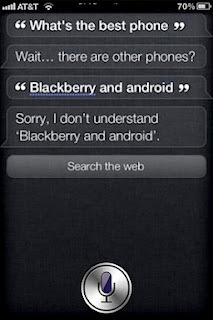 After a day of ribbing from giddy Windows Phone fans, somebody at Apple gave Siri a lecture in brand-loyalty. Or maybe they employed the old duct tape, screamed abuses and rubber hose method. Either way, she's been 'corrected'. Now, if asked 'What's the best phone', Siri gives a coy, playful response but basically demurs. And Siri absolutely, positively does not check in with Wolfram Alpha. Yes, sir, the folks in Cupertino take their product integrity mighty serious. Sure, some might say this Siri thing was scarcely worth the time to patch. But others would tell you that sweating the details is what separates the best from the rest. Either way, at least now we know Apple has man-hours to spare.. Seriously, we'd hate to even call that a bug. Forget we ever brought it up.